I’m positive our elf Josie gets cold when she travels back and forth from the North Pole. So to go along with her elf boots, elf apron skirt, little elf messenger bag, and elf ribbon tutu, I just had to make an Elf Sized No Sew Scarf. 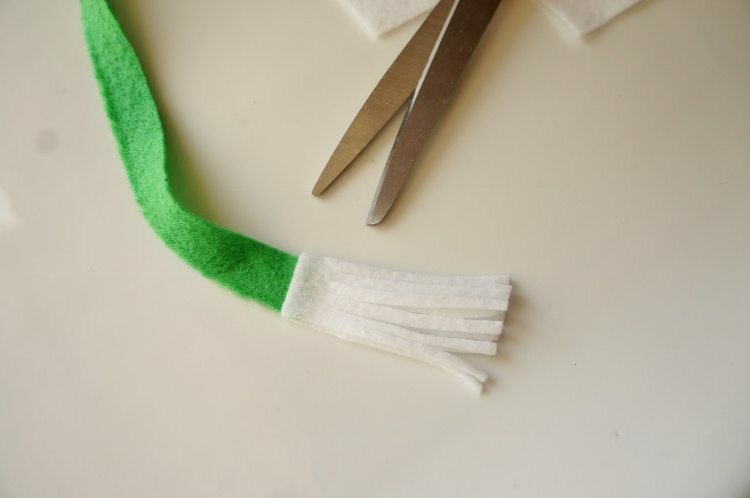 This is another easy craft that takes a few minutes and costs less than a dollar to make. I raided my craft room and looked for felt I already had laying around. You don’t need much. 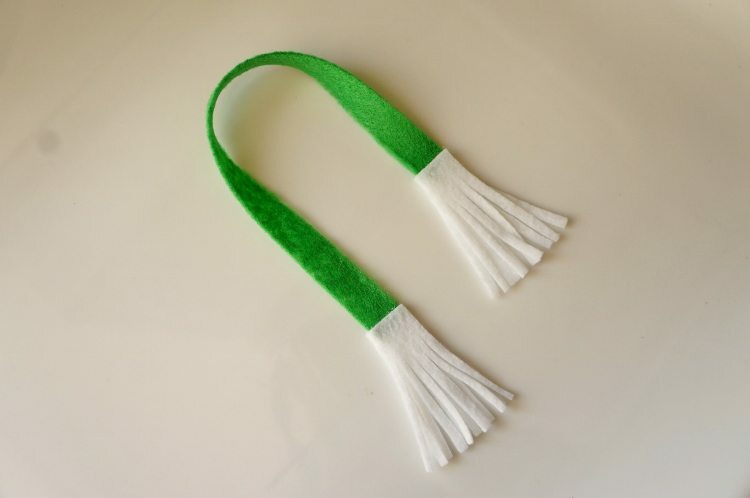 I picked green and white to contrast our all red Josie. All I did was cut a long thin strip for the scarf and two white rectangles measuring twice the width of the scarf. I folded it over the ends of the scarf and hot glued it together. Next I fringed then ends with scissors. You can also add ribbon trim if you like.In minutes I had a cute little scarf for Josie that cost me nothing! Elf on the Shelf First Day Idea– A cute poem and FREE printable for your elf’s arrival. 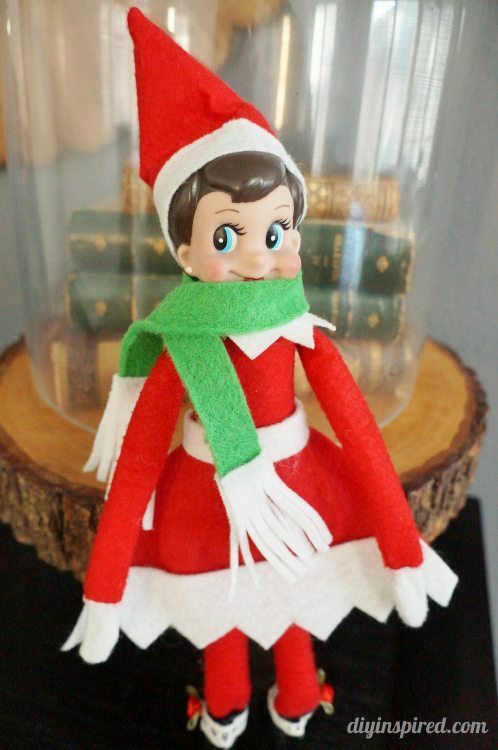 No Sew Elf on the Shelf Skirt– The Elf on the Shelf clothing you can buy at the store is so expensive. 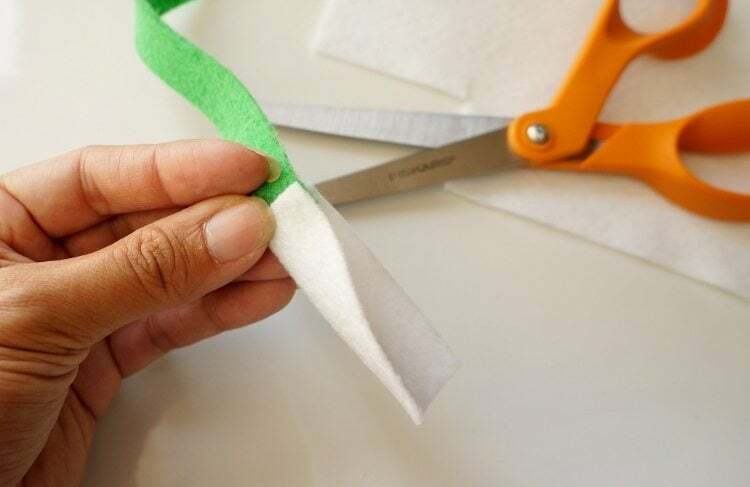 This is a quick and easy no sew tutorial for how to make an apron skirt for pennies. How to Make Elf Shoes– One day Mia asked why Josie did have shoes. The next day she showed up with a new pair! Elf on the Shelf Bad Day Poem with Printable– Speaking of misbehaving, I ended up creating this FREE printable with a poem from your elf for the day after your child(ren) has been not so nice. In case you missed it, check out all my crazy Elf on the Shelf posts! Here is another video of some of my ideas. Enjoy!